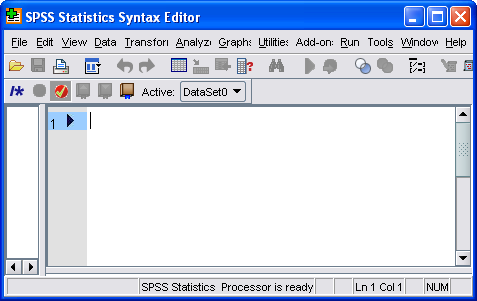 Once you click on Syntax a new syntax editor screen will be displayed as shown below. The DATA LIST and BEGIN - END DATA commands are used to input data through syntax editor . This is the best way when you want to keep your data and the program for reading your data together. DATA LIST defines the names and column locations of the variables. There are two major variants of DATA LIST, which are fixed format and free format. 2. DATA LIST LIST : Free- format data with one case on each record. 3. DATA LIST FREE : Free - format data. BEGIN DATA and END DATA must be used together. END DATA must appear by itself on a single line, with no leading white space and exactly one space between the words END and DATA. DATA LIST LIST / Name (A20) score percent. DATA LIST FREE / Name (A20) score percent. 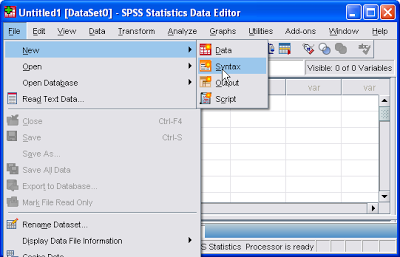 1 Response to "SPSS : Enter Data via Syntax Editor"